Windows 8.1 continues the vision we began with Windows 8 and is an example of our commitment to continuous innovation and improvement for our customers. 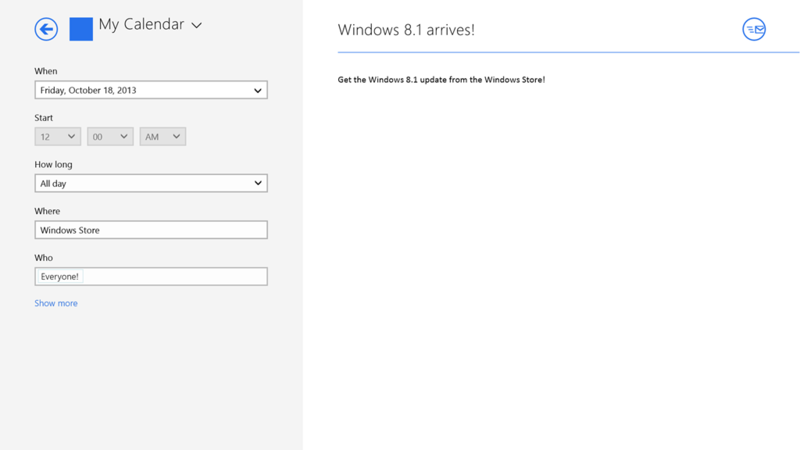 And Windows 8.1 brings many improvements in areas like personalization, Internet Explorer 11, search which is powered by Bing, built-in apps including a few new ones, an improved Windows Store experience, and cloud connectivity with SkyDrive (and much more) that people will enjoy. If you haven’t already, you can give many of the new features and improvements in Windows 8.1 a try with the Windows 8.1 Preview. Business customers can begin testing Windows 8.1 for deployment in their environments with the Windows 8.1 Enterprise Preview. Now is a great time to buy a Windows 8 device in a range of different form factors like Microsoft Surface, the Acer Iconia W3, the Lenovo Yoga 11s, the Toshiba KIRAbook or the Dell XPS 18 . For students going back to school, we haveWindows Chip-in which is a crowdsourcing program to help students and parents purchase a new Windows device for school. And the Windows Store Only at Best Buy store-within-a-store experiences will be launching throughout August and September, just in time for the back-to-school shopping season to check out all the latest Windows devices! If you buy a Windows 8 device today, you can look forward to the new features and improvements from Windows 8.1 in October. It’s very exciting to be delivering Windows 8.1 and Windows 8.1 RT to consumers just before Windows 8 and Windows RT celebrates their 1-year anniversary. You can expect to read more from us on Windows 8.1 leading up to availability on October 18th!